Every year seems to have some outstanding mushrooming event for me. 2009 was the year of the discovery - discovering unfamiliar mushrooms. It's one of my favorite things. 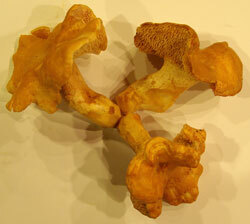 Let others fill their baskets with chanterelles and boletus. That's OK with me. I'm into discovery. 2009 found us encountering fungi in Port Orford that we'd never previously found. How can that be? Over the past 10 years, we've spent many a carefree hour wandering the forestlands that dominate the landscape. 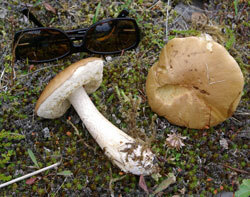 Yet, it was only in 2009 that we sighted gymnopilus spectabilis and other heretofore unseen fungi. Serendipity, that's the only possible explanation! Another discovery: Thanksgiving 2009 was spent in Yosemite. Imagine our astonishment when the fee taker at the entrance to the national park answered our question about mushrooming by pointing and saying: "There's a huge cluster of some kind of mushrooms over there". He was most certainly right. We were greeted by a massive collection of collybia growing within 200 feet of the west entrance to the park. And yet another discovery: mushrooms in Iceland. Can there really be forests and mushrooms in a reputedly treeless landscape? Much to our delight we learned that Iceland had begun an extensive afforestation in 1950, resulting in the planting of millions of seedlings over the years, 30% of which were native birch. On a whim, while driving the Ring Road, we pulled off the highway, walked about 50' over to the fencing that enclosed a replanted parcel of land and came upon a fine collection of boletes. Our optimism was rewarded! Surely that's what keeps me motivated to continue wild mushrooming even after all these years: the discovery, the challenge of unearthing a new-to-me species. It's this incentive that is the driving force that lures me back into the woods time after time. And, it's one of the reasons that I'm looking forward to 2010 with such enthusiasm! It's the end of an indulgent holiday season, and the start of a new year. We've been watching our calories and looking to Cooklight Light for inspiration when it comes to preparing delicious yet sensible weeknight dinners. This particular recipe caught our eye for a number of reasons. It is quick and easy to prepare. It specifies exotic mushrooms. We are so fortunate to have hedgehogs growing right outside our door! We're in the midst of a wonderful hedgehog season! Hedgehogs are abundant this January!